Sunrise: natural sunlight & camp fire. Note, the view seen here is looking south west, therefore the sun is on the left & out of direct view. 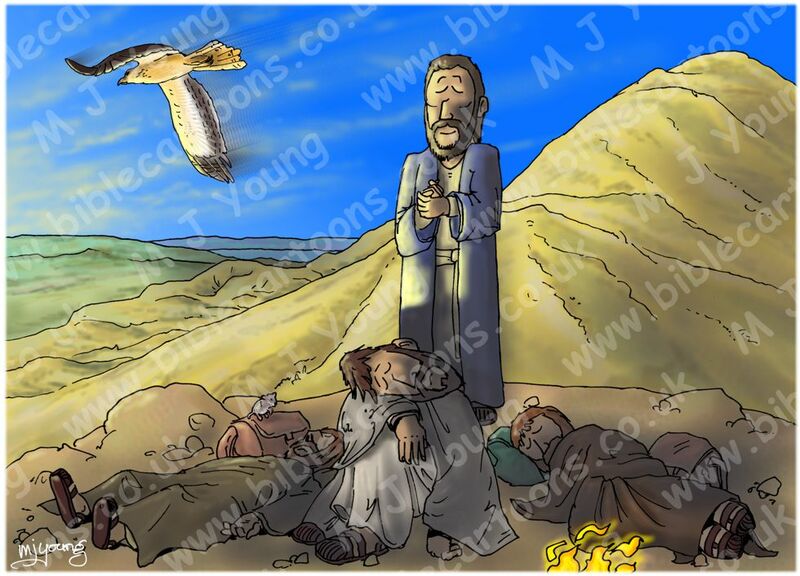 Scene 02 – Jesus prays – Jesus, Simon/Peter, James (son of Zebedee), John (son of Zebedee), Snow Vole, Bonelli’s Eagle. The story clearly tells us that as Jesus prayed his disciples were asleep. I deliberately set Jesus & the 3 disciples here, so that mt. Hermon was in the cartoon, with a view that includes the Sea of Galilee (behind & to the left of Jesus, in the far background) to help the viewer orient themselves. Research helped me to identify a suitable bird to put in the sky: the Bonelli’s Eagle is found in & around mount Hermon. Technical note: I have used the Photo Paint “motion blur” effect for the first time i this scene – which gives the eagle a lovely sense of movement.